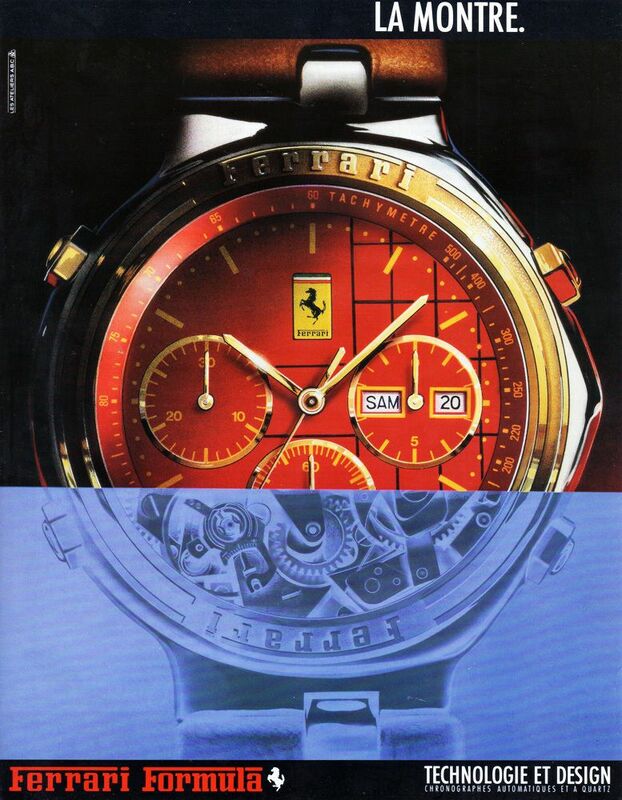 The Cartier Ferrari Formula quartz chronographs were, in their day, without question the most expensive of the re-branded 7A38's. 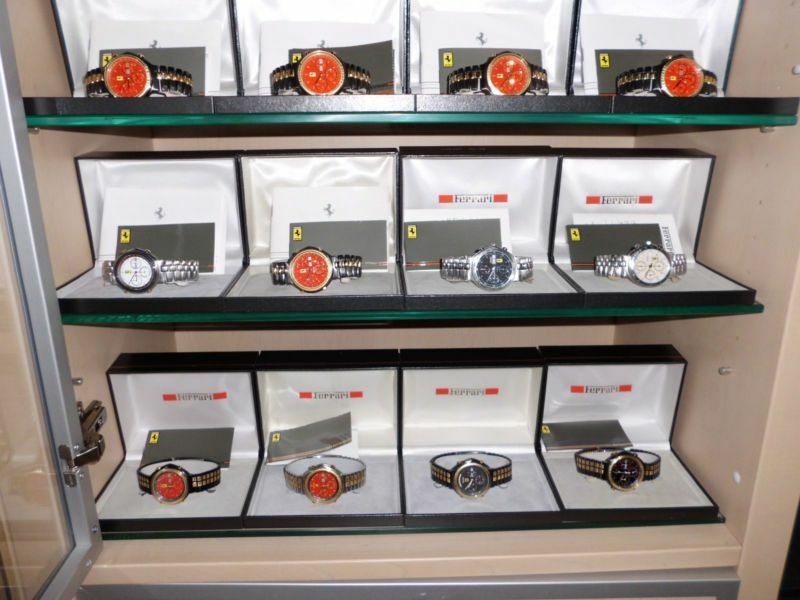 The recommended retail prices were in the order of 4 times that of their humble Seiko 7A38 cousins. 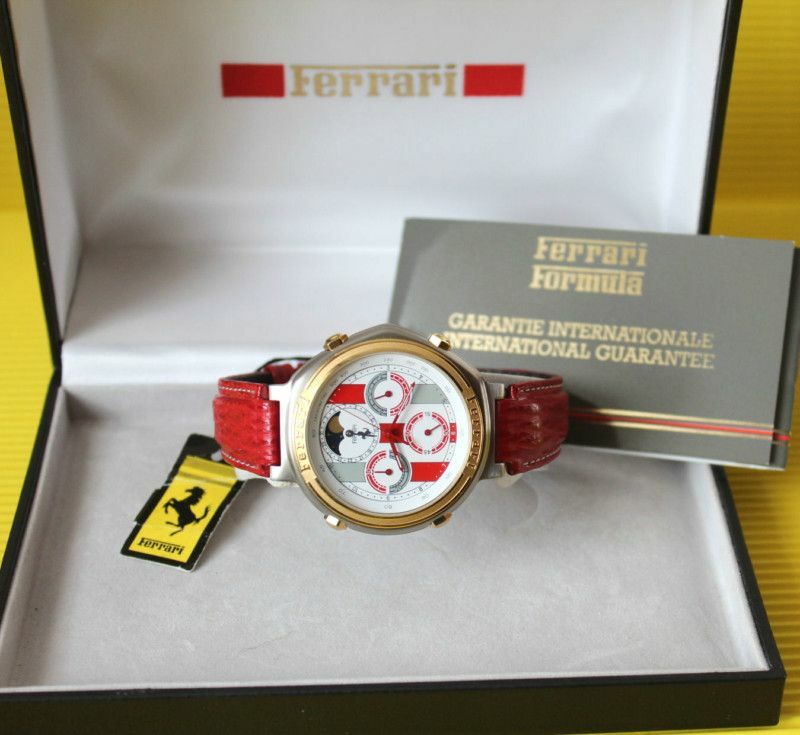 Yet the 15 jewel quartz movement inside is exactly the same - apart from the anti-magnetic back-plate, which is printed (not even stamped, just printed) with Ferrari logo, the iconic Prancing Horse and CAL. 531. The positive battery terminal plate (as with most rebranded 7A38A movements) is left blank. 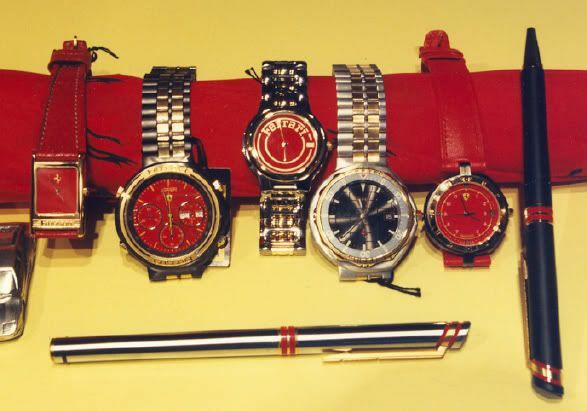 Yes, they are just as susceptible to acid attack from old run-down batteries, and rust just the same as their Seiko 7A38 siblings. 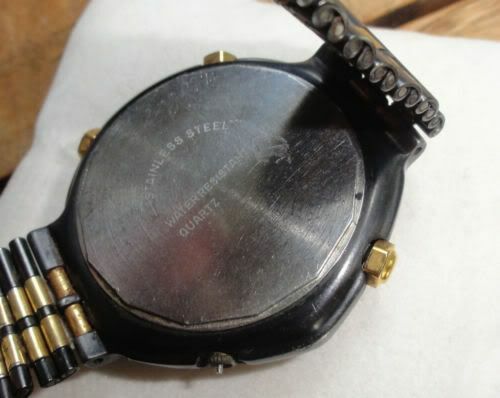 The case-backs are often (but not always) stamped 'Swiss', which is presumably where the cases and bracelets were sourced. 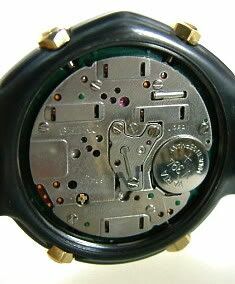 But looking at the watch externally (apart from the familiar 7A38 dial layout), there are few clues as to what actually lies inside. 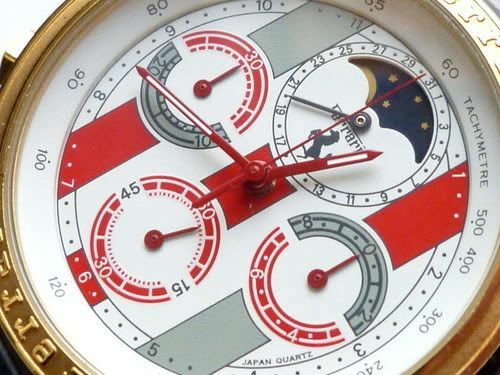 If you look very closely at early production units (from the first year), you'll find JAPAN QUARTZ printed on the 9 o'clock subdial. 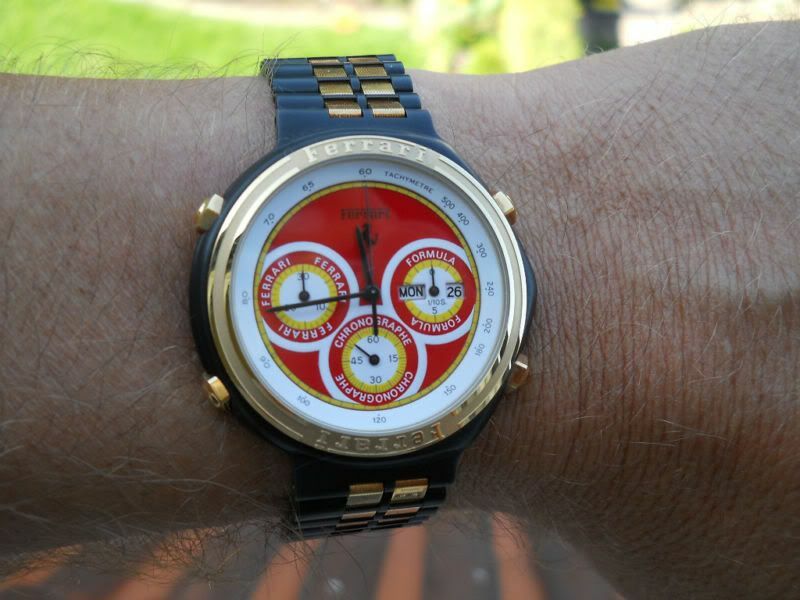 Popular myth has it that it was removed from the dial at the behest of the 'Old Man', though it was probably more likely driven by marketing and / or regulations. From then onwards, instead just QUARTZ (without Japan) appeared stamped on the case-backs. 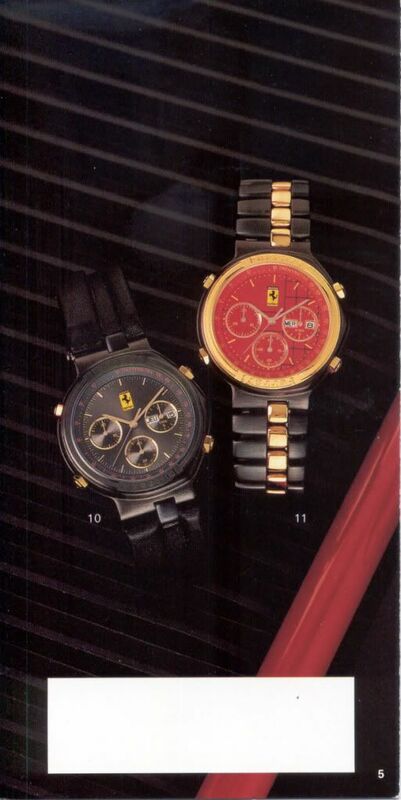 The watch above is one of the first (of many) design permutations released, and was sold under the TestaRossa model name. 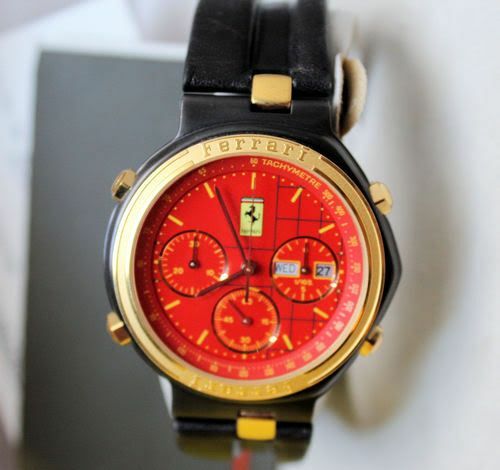 It was obviously one of Cartier / Ferrari's biggest sellers, and is certainly, by far the most commonly found used variant on eBay. 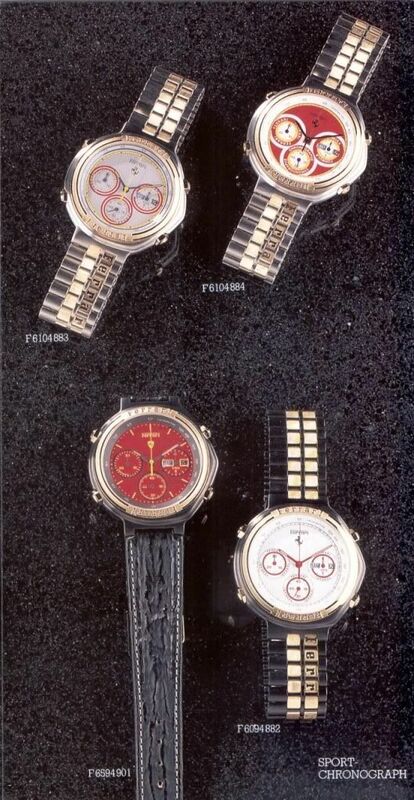 The watch in the lower two photos being the same model as in that French advert. 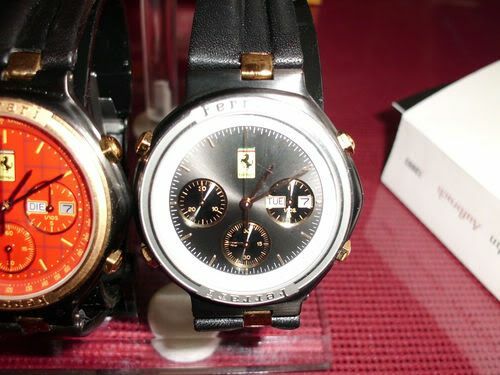 As far as I know, both watches went unsold. 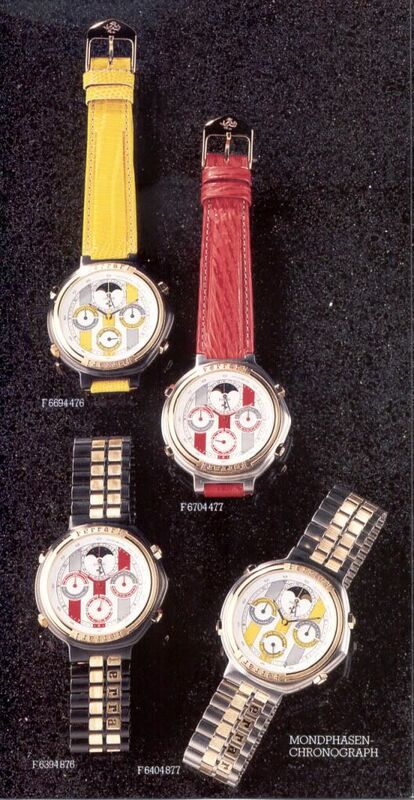 So it naturally follows that the various models with red dial faces were the most popular choices. 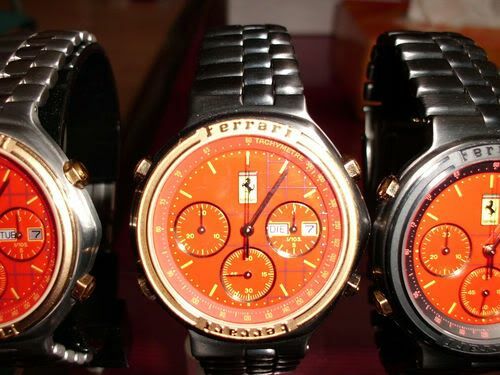 By the same logic, any used (or NOS) red-dialed Cartier Ferrari Formula chrono's offered on eBay will often command higher prices. 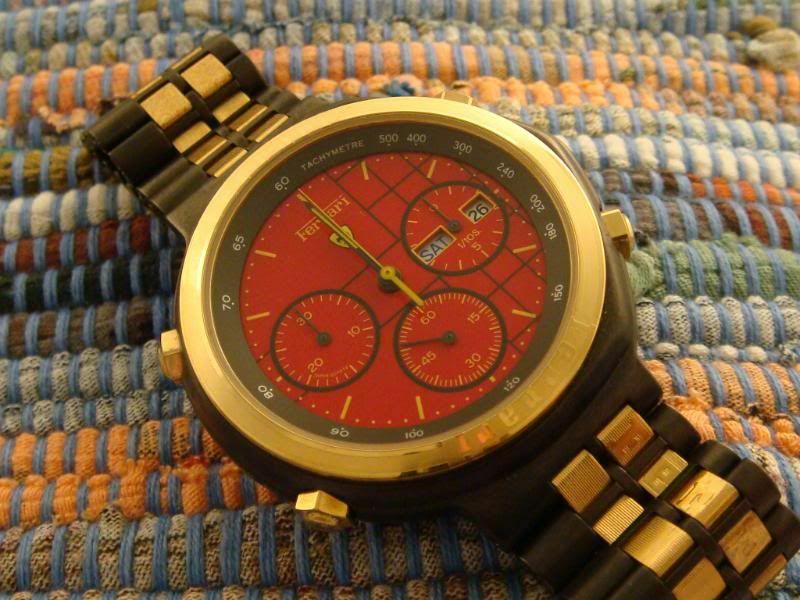 The problem with buying potentially expensive (or cheap) watches, as is unfortunately the case with many other luxury commodities on eBay, is that there are all the usual pitfalls to watch out for. 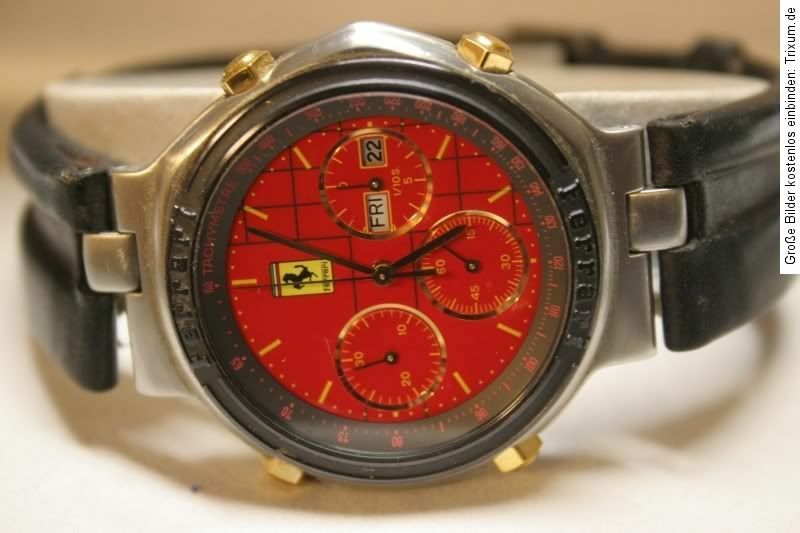 Shill bidding appears to be rife; some auctions are private listings; quite a few auctions are ended early (and sometimes re-listed with optimistic Buy-it-Now prices), and you'll even come across that daunting 'probably just needs new battery' gotcher clause on the occasional listing for a Cartier Ferrari Formula chronograph. Run away. 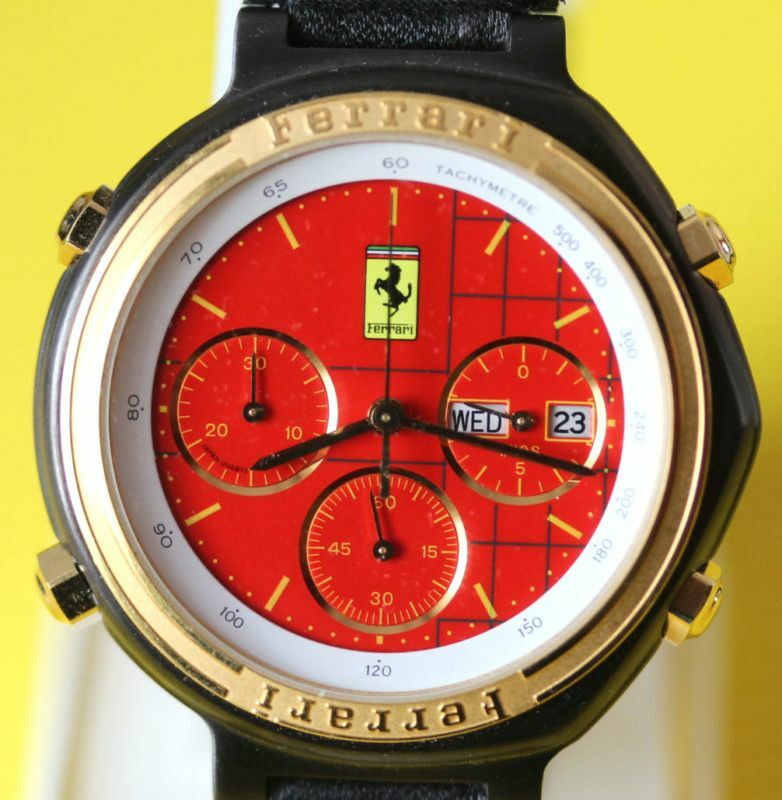 Even with obvious or stated faults, the red-dialed variants of these Ferrari Formula chrono's still fetch good prices on eBay. 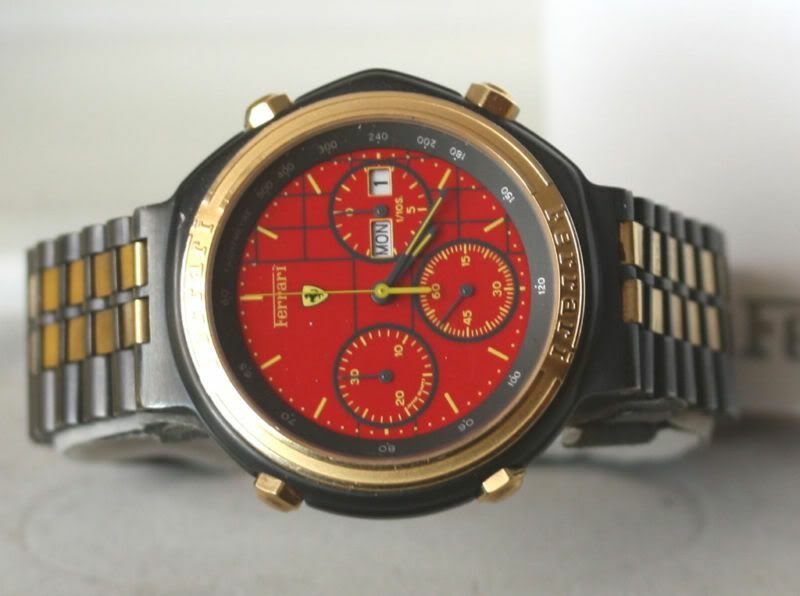 It sold for only 290 Euros in August 2011. 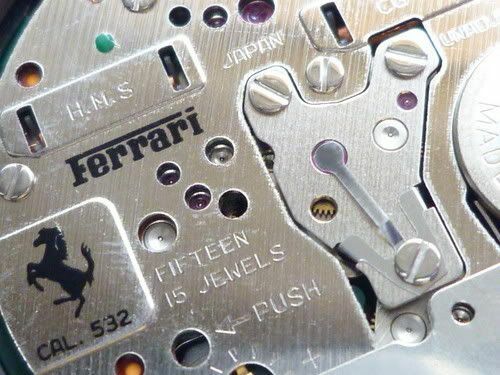 Apart from having no box and papers, it was also missing a hex-nut pusher button, an all-too-common problem with these watches, and one to be wary of, because replacements are no longer available from Cartier. 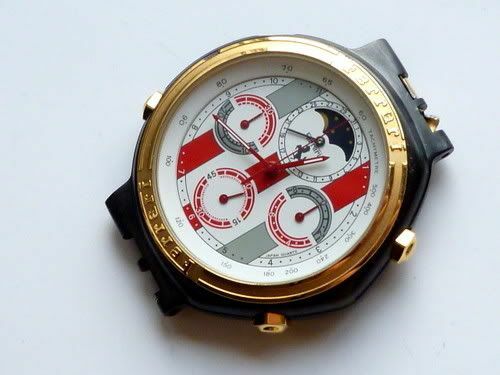 Indeed, looking back through my eBay watching page, the most recent ended auction (by bidding, as opposed to a Buy-it-Now), for any red-dialed version, was this one from last month, which sold for 445 Euros (approx. 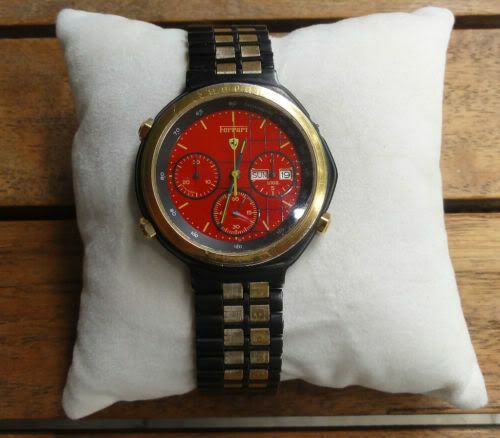 £369.56) after 28 bids, on 29th February. Es handelt sich um keinen Nachbau bzw. um keine Replika. 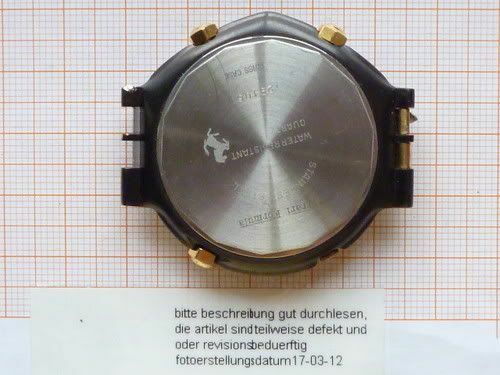 Der Uhr ist die Original-Beschreibung sowie der Original-Garantieschein incl. 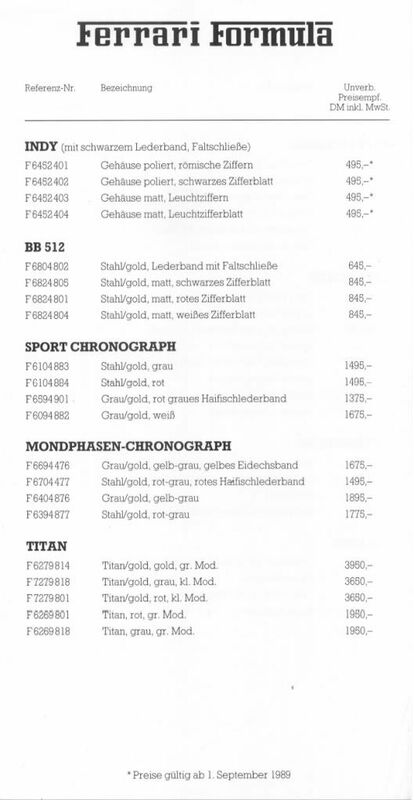 Juwelier-Stempel beigefügt. 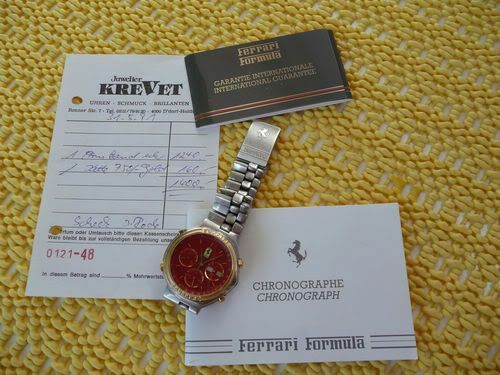 Note the inclusion in the sale of the original sales receipt from May 1991 for 1400DM. The problem with it ? 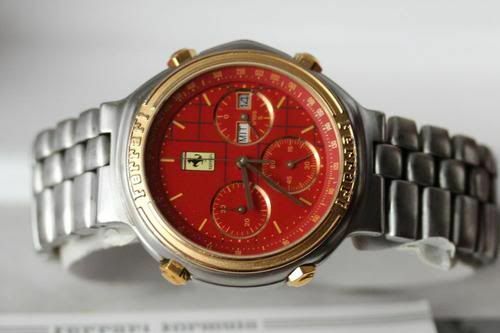 Google translates as: 'large pointer of the stop watch hangs firmly' meaning a recalcitrant sweep second hand. A fairly common fault with 7Axx's and sometimes easily remedied, particularly when caused by just a displaced finger tension spring. 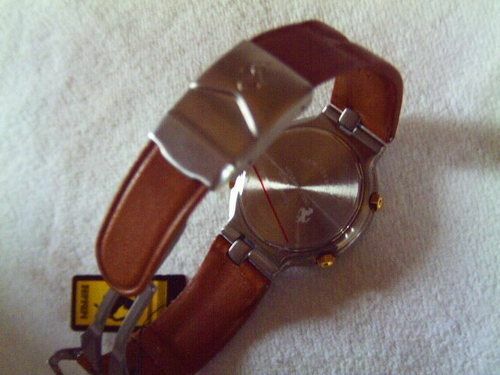 That small photo came from an eBay listing in November 2009. 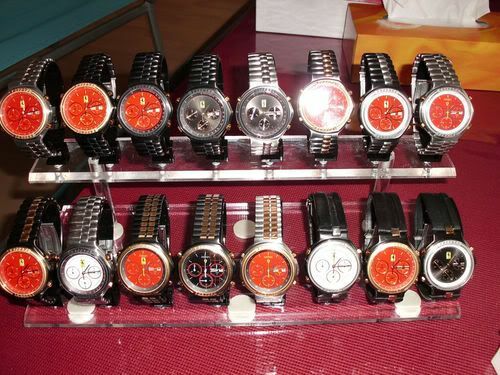 The German seller was asking 1050 Euros as a Buy-it-Now. 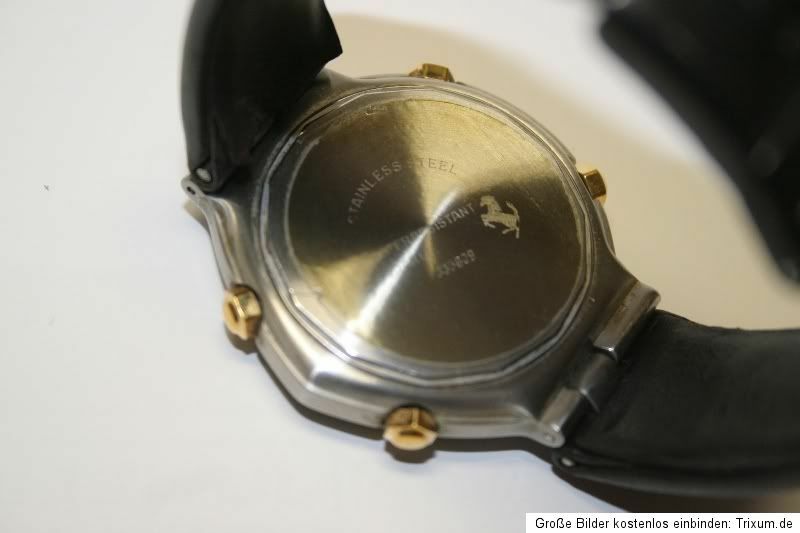 If you look carefully, you can see SEIKO stamped on the back-plate, where Ferrari would usually be printed on a Cal. 531. Funnily enough another of the same model with a flat battery, is currently listed with an opening bid price of 750 Euros ! Das Glas ist durch Kratzer leicht beschädigt. Die Batterie ist leer. 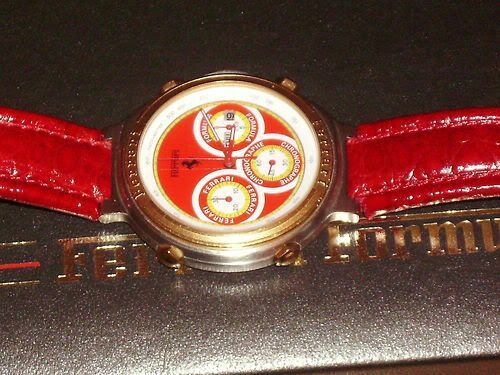 This was listed on eBay Gemany at the end of January, with an opening bid price of only 1.00 Euro. 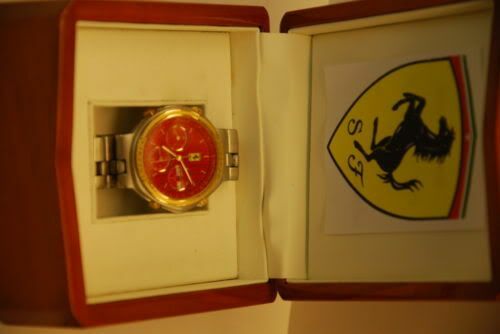 It was in average used condition; fitted with a non-original red leather strap, but still had the gold-plated Prancing Horse logo'd buckle. 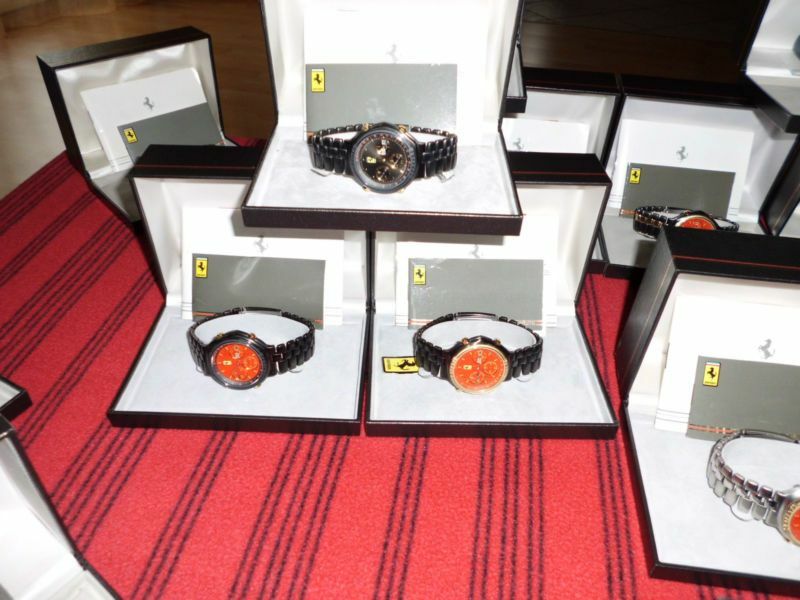 I don't like paying 'big bucks' for these watches, particularly knowing what's inside them (albeit signed Ferrari Cal. 531). I saw the chance of a bargain buy, and made much of the early running in the bidding. But, when I messaged him, the seller steadfastly refused to ship out of Germany, even if I won the auction, and so I stopped bidding. 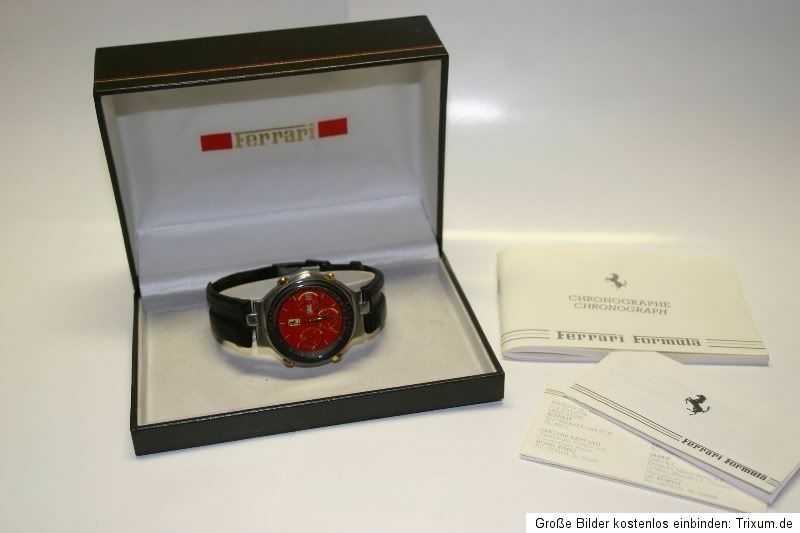 It sold for only 262.00 Euros (approx. £217.59) after 15 bids, which really irked me at the time. A month later the seller listed a light grey-faced version, which with Simon's German colleague's help we managed to ship 'Ausland'. 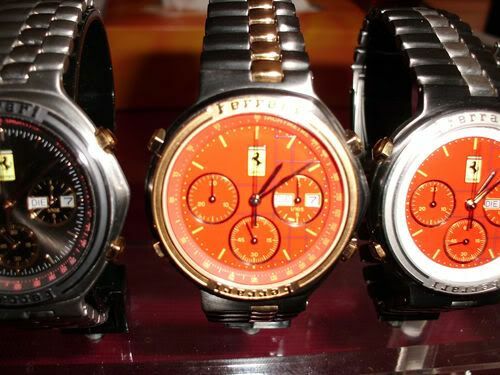 Even Cartier Ferrari Formula brochures, which include these watches, appear to sell for 'silly money' sometimes .... Or do they ? I'm afraid my 'filing system' appears to have failed me for once. Or should I say the limitations of my eBay watching page have. 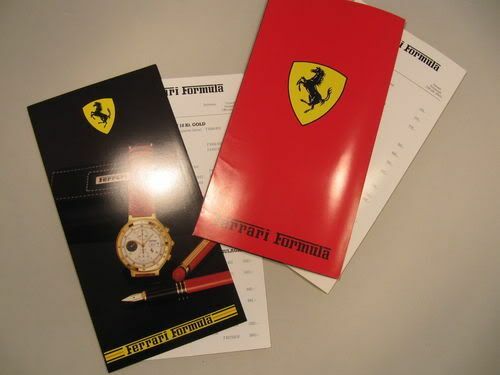 I appear to have deleted the original identical listing, from a week earlier in February, where this pair of brochures were bid to over 35.00 Euros ! 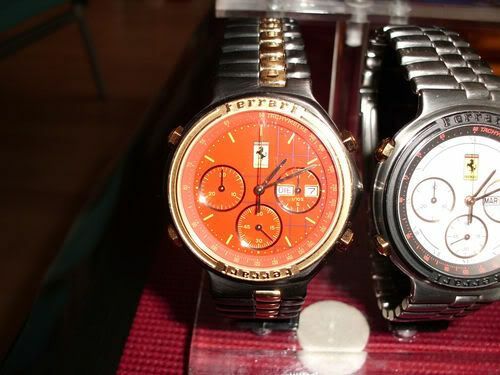 Both auctions were 'private listings', where even the abbreviated eBay ID's are hidden. 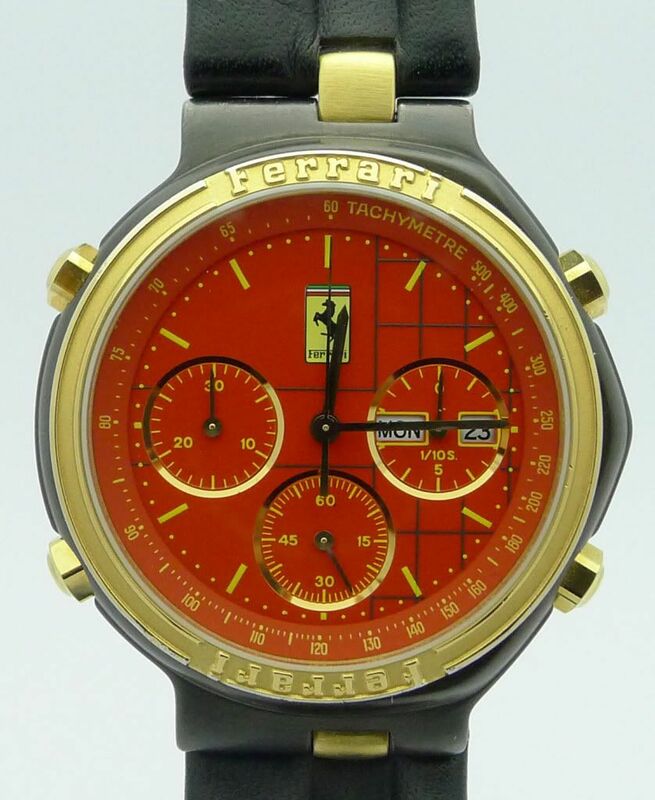 I suspected shill bidding, so wasn't surprised, when a day after the original auction ended, they were re-listed. Next time around they only made 8.50 Euros. 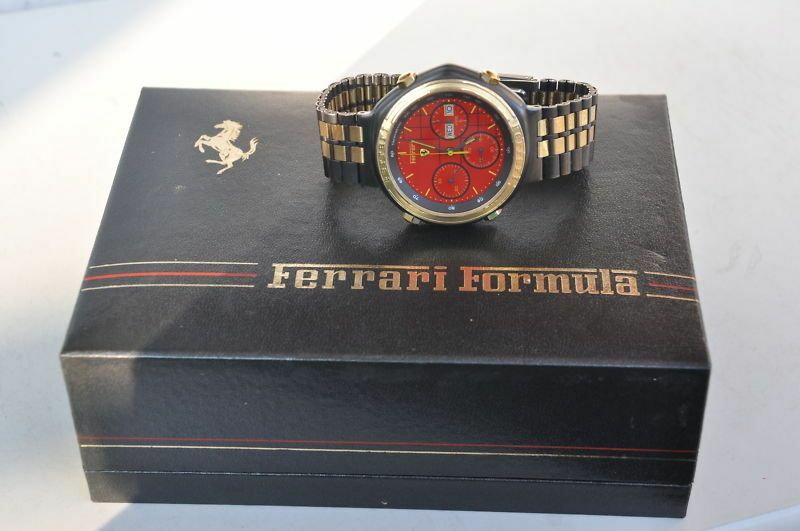 Before I ramble on any further, I think it would be remiss of me for not thanking recent joinee, Michael Rothe, for pointing me in the direction of the Cartier Ferrari Formula '7A38's. Or perhaps I should curse him. 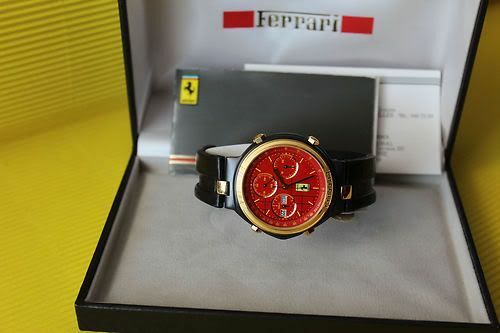 Believe it or not, having been a Ferrari enthusiast since the mid-60's and a card watch-carrying 7A38 enthusiast since the late 80's, I hadn't actually made the connection myself. 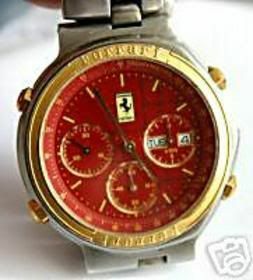 There is also a Ferrari 7A38, but I don't have pics and can't remember where I saw it. 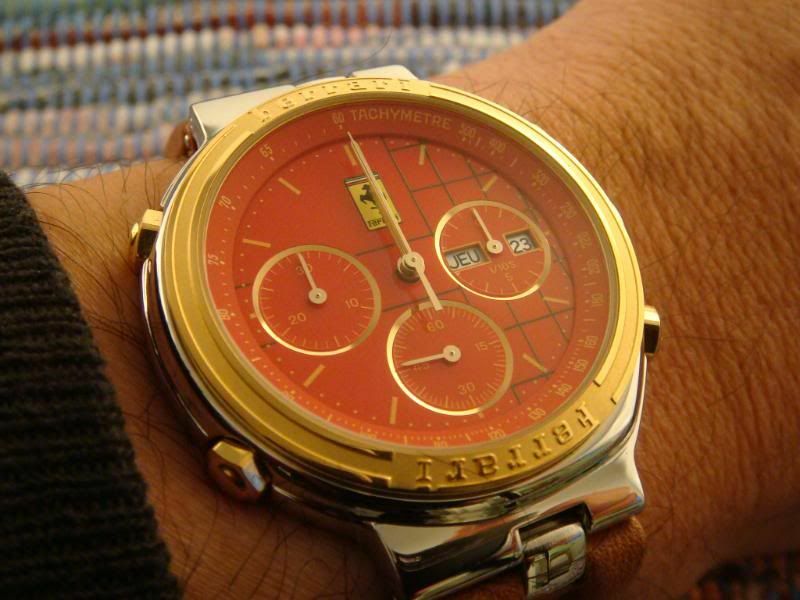 'Cartier Ferrari' Seiko 7A38 exposed at last !! I was so enthusiastic in those days. 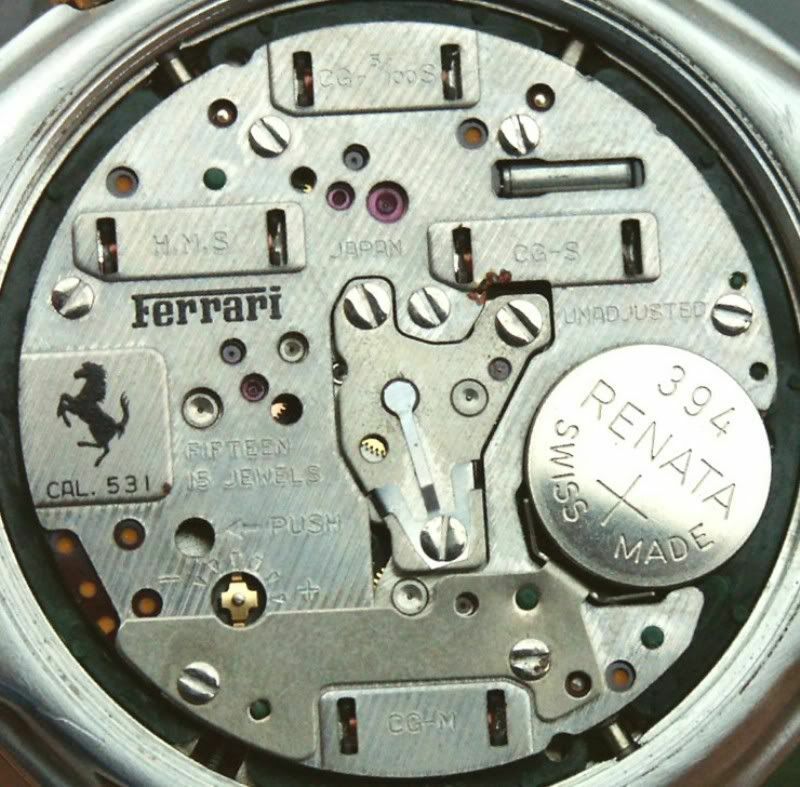 Even having been a dealer, and still owning three Cartier Ferrari Formula Chronographs himself (he's also a bit of a watch collector), Nathan had no idea what 'humble' quartz movement lurked incognito, within them. 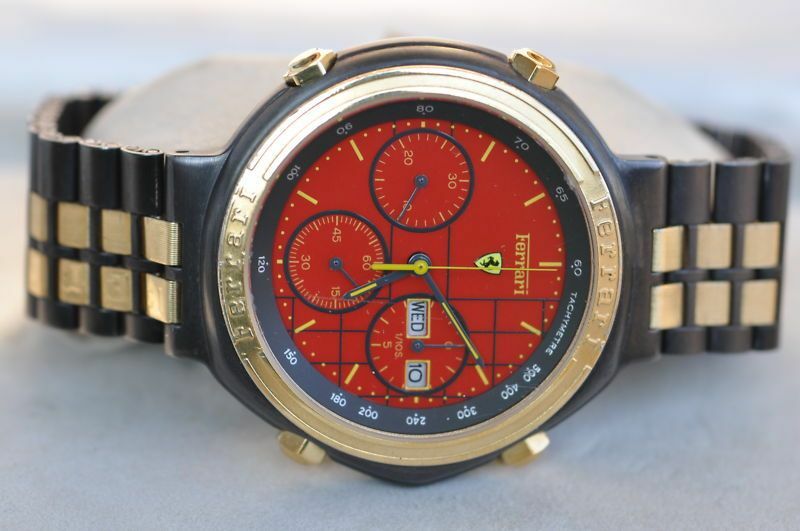 In March 2009, after hearing of my enthusiasm for them, and with the help of another Stateside Ferrari enthusiast, Nathan finally bought a lowly Seiko 7A38 - an almost mint 7A38-728A two-tone, for a fraction of the price of the Cartier Ferrari Formula chronographs he used to sell. I later put him us both straight. 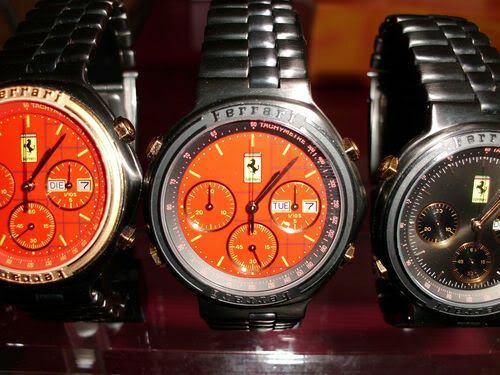 Being something of a Ferrari buff myself, my own enthusiasm for the Cartier Ferrari Formula chrono's has been smouldering away in the background ever since I (re)discovered them in November 2009. 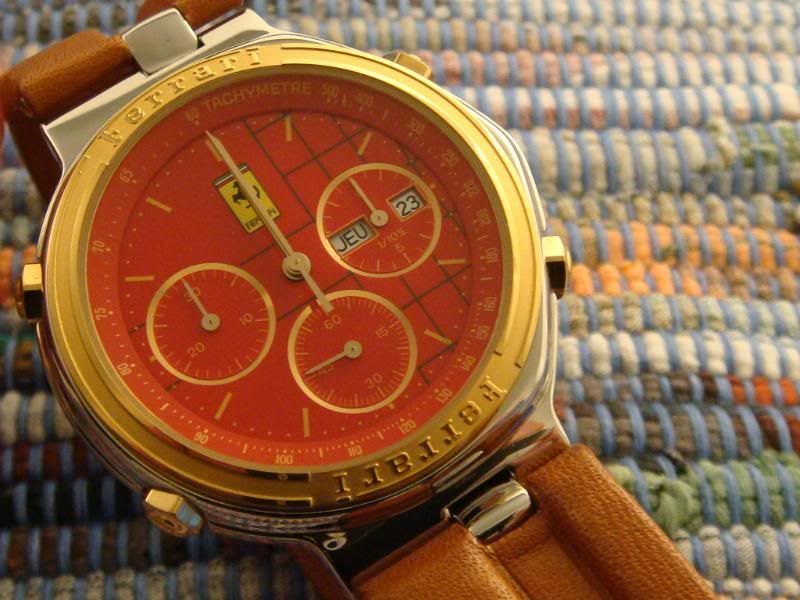 Though, with so many other more affordable makes of 7A38, besides Seiko's own brand, to collect, I've deliberately allowed my desire for them to wane. However, I've probably watched most listings which came up in my various eBay searches, and in almost all cases, religiously recorded their asking / final selling prices. My interest in them was rekindled earlier this year, when a German collector offered his collection of 14 on eBay. 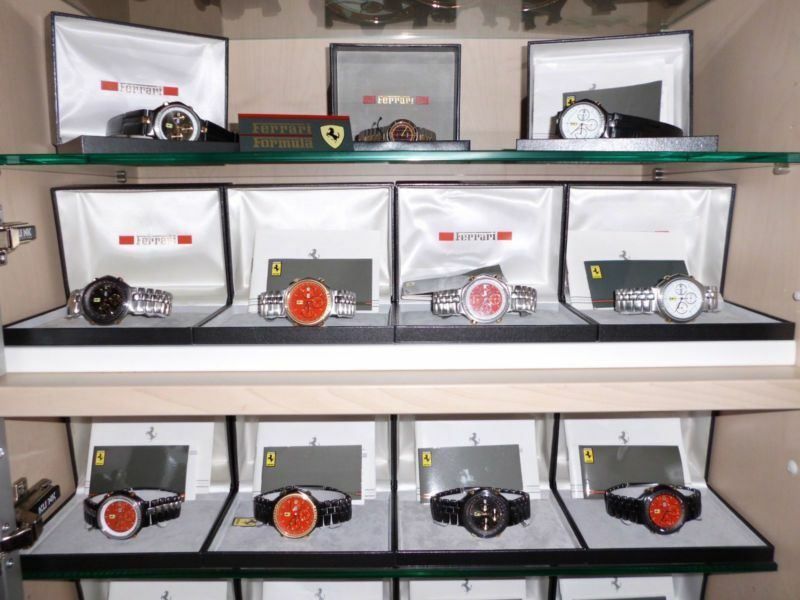 You'll observe that a high proportion of those watches (compared to the entire Ferrari Formula model range) have red dials too. If you've clicked on any of the eBay links which I've included in the thread so far, you'll have noticed another common denominator. 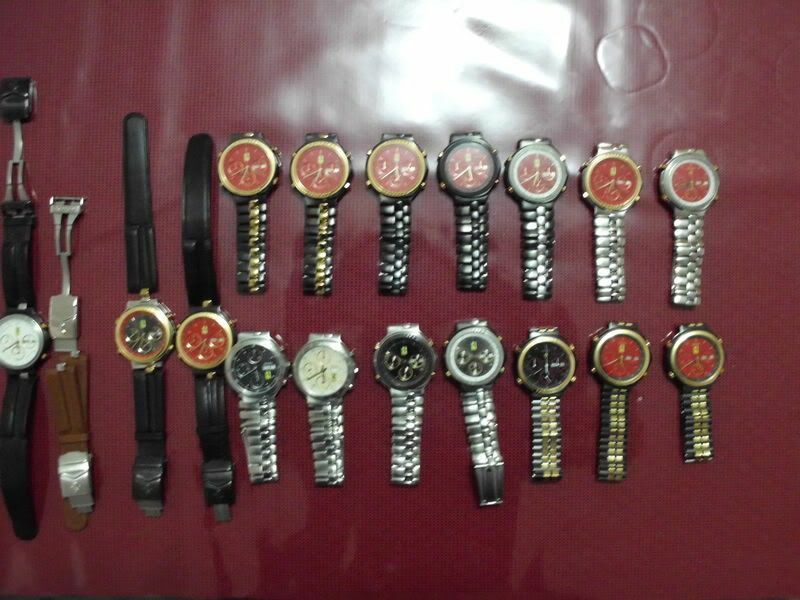 Nearly all these watches, are coming out of Germany. The country is absolutely inundated in the things. 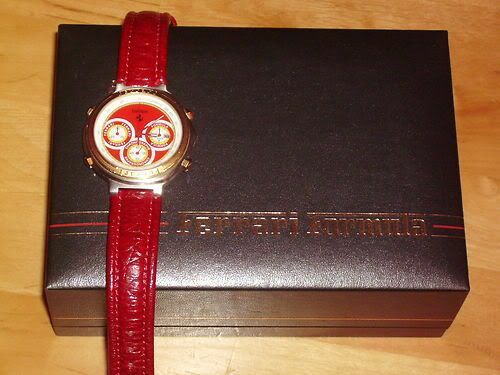 In fact, I think I can say without fear of contradiction, that there are currently more Cartier Ferrari Formula's listed on eBay Germany than there are Seiko 7A38's ! So I thought it might be interesting to watch a few of the current eBay listings for red-faced versions, to see what prices they achieve. 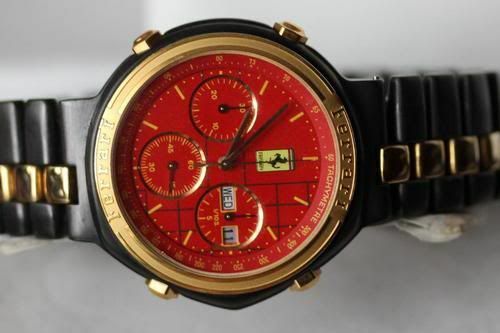 Ferrari Cartier Herren Uhr neu und ungetragen ! Rarität ! 1. Besitzer, direkt beim Juwelier neu gekauft. Incl. Papiere OVP. Rarität ! 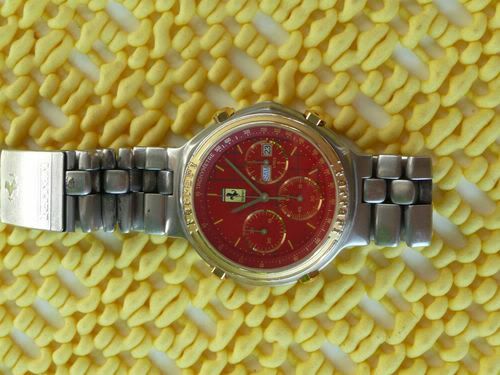 That one, which is listed as 'New with Tags' is currently already at 1015 Euros (approx. £843) with still nearly 2 days to run. Mostly due to the efforts of a low feedback bidder s***a (3) who has placed 13 of the 27 bids. A shill perhaps ? Who knows. 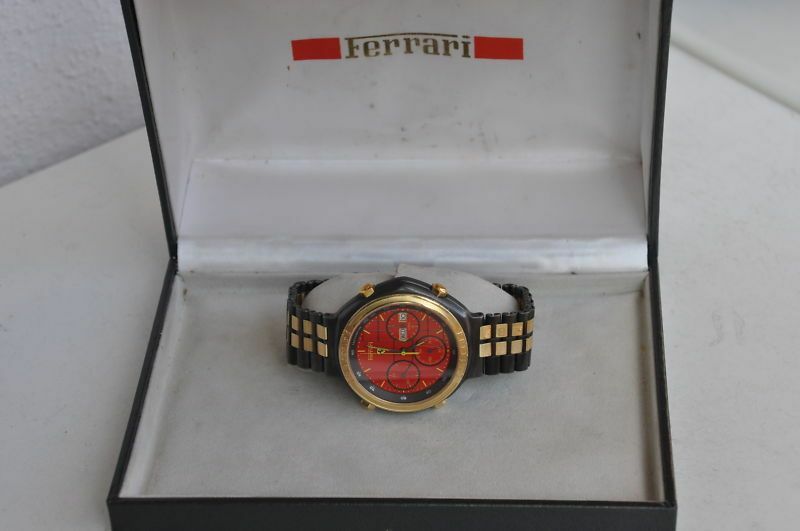 Update Edit: 12 hours later, bidding had reached 2110 Euros (approx. £1760) after 36 bids .... with another day still to go. The high bidder ? Not a surprise really - another Zero-feedbacker -***r ( 0 ). 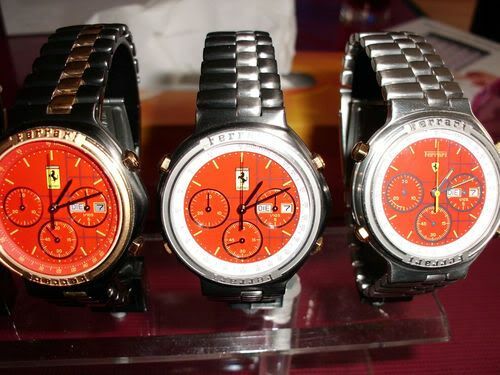 The next 3 are all being offered by the same seller 'abgrabscher0'. So, purely for consistencies sake, you understand .... 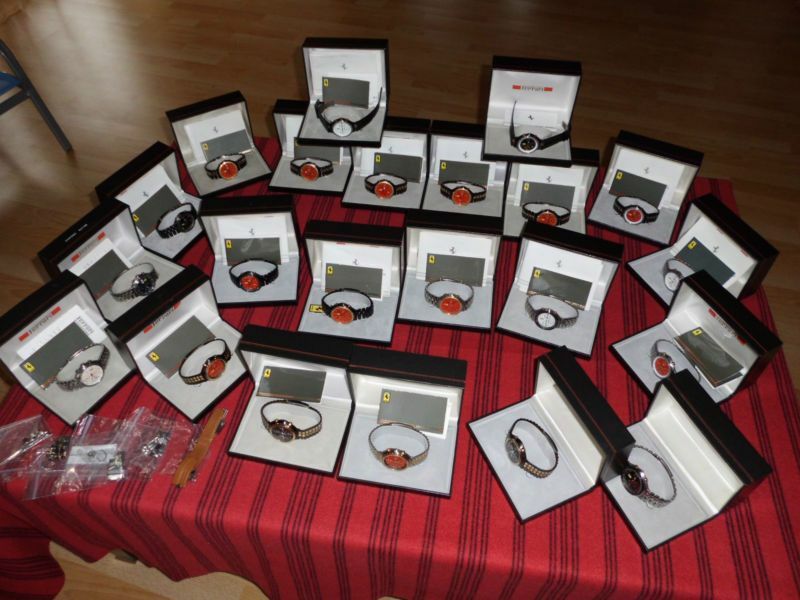 I bumped the bidding on each one to 300 Euros, to give them a level start. 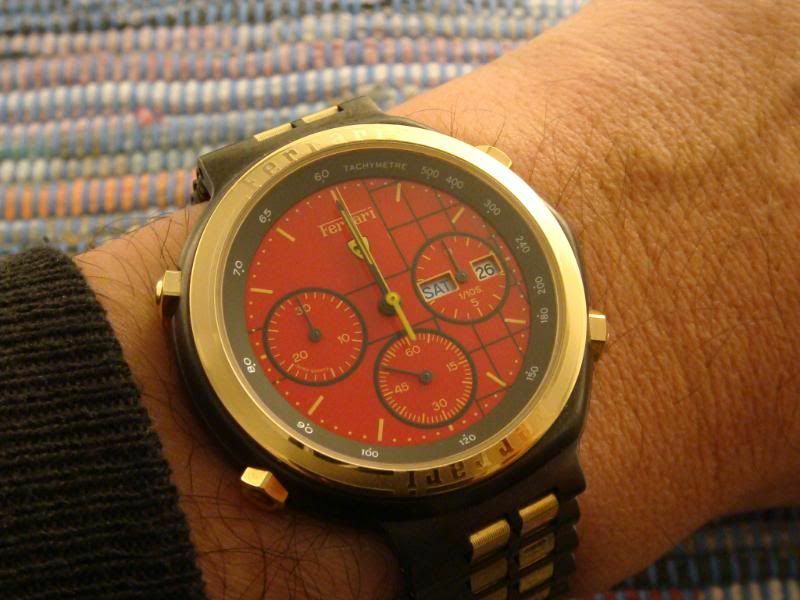 Note the unusual black chrome bezel finish and matching Tachymeter dial ring. 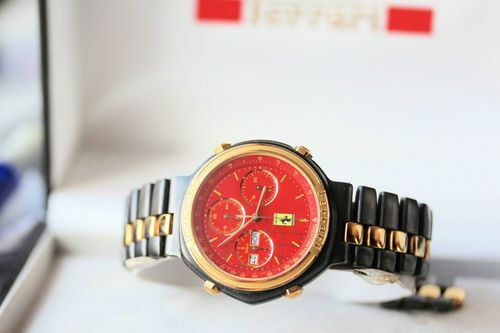 The opening bid price on that one is 1490 Euros. It'll be interesting to see how they all end up - shill bidding or otherwise. I'll update the thread with the final results in due course. 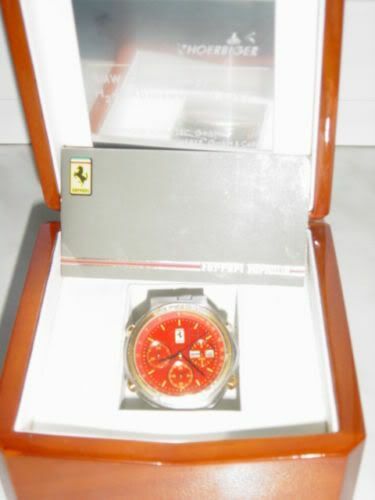 Lastly, although not an auction, a special award has to be given to German eBay seller 'linckersdorff_gmbh'. 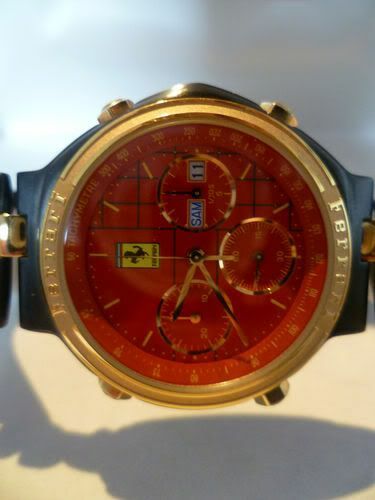 But also for unabashed bare red-faced cheek - this dealer's Buy-it-Now asking price ? A mere 1500 Euros (approx. £1,250) !! PS - Don't ever let anybody try to convince you that these things are 'Rare'. I'll update the thread with the final results in due course. 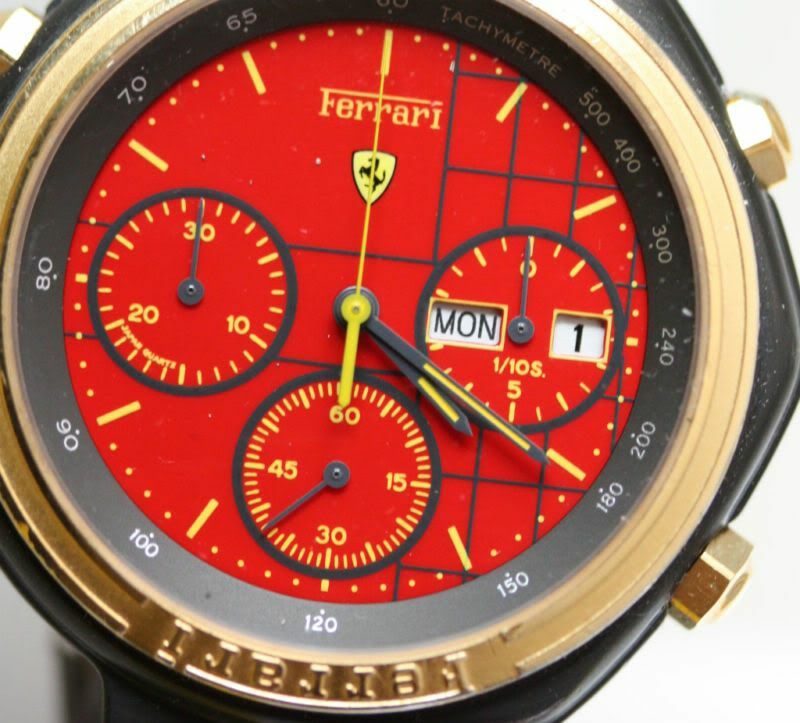 and it's not looking good for anyone who might be contemplating the purchase of a red dialed Cartier Ferrari Formula chrono'. In fact, it's all gone Pete Tong again. .... appears to have sold, for that opening bid price of 750 Euros, to that presumed shill low-feedback bidder s***a (3). .... Well, I won't say 'sold', yet, but it finally ended after 42 bids at 2676.00 Euros (approx. £2224.54) - won by -***r (0). because for that kind on money you could buy a very nice example of the far more expensive Valjoux 7750 powered version. http://www.ebay.co.uk/itm/190653015211 was ended early on Wednesday 21st (all existing bids were cancelled). 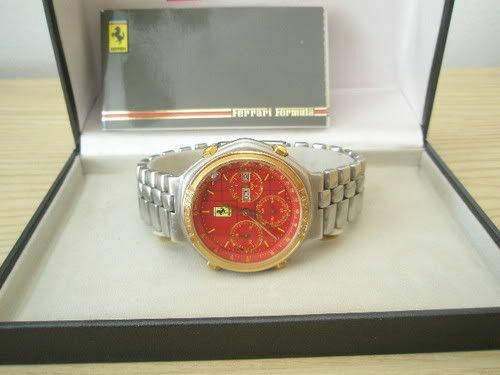 http://www.ebay.co.uk/itm/190653015872 ended on Saturday morning 24th, making 770 Euros (approx. 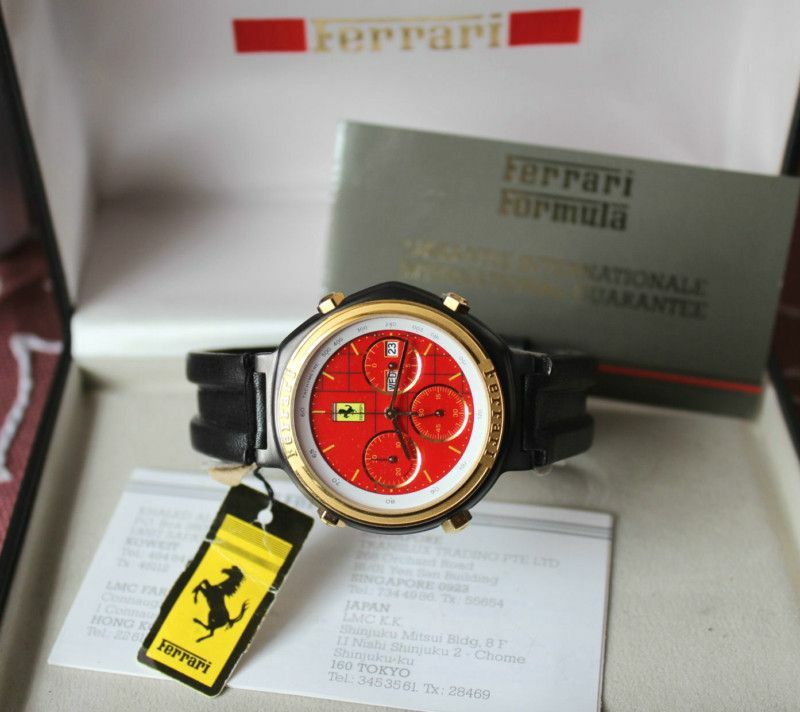 £643.75) after 22 bids. 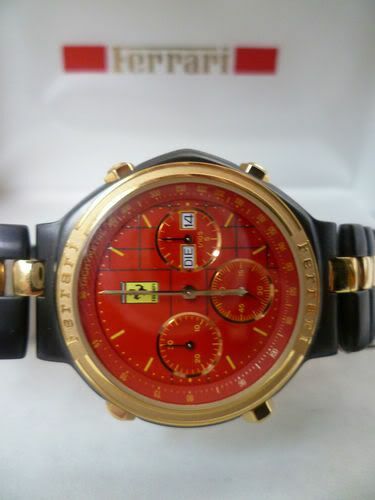 http://www.ebay.co.uk/itm/190653016077 also went the distance, ending soon after at 771 Euros (approx. 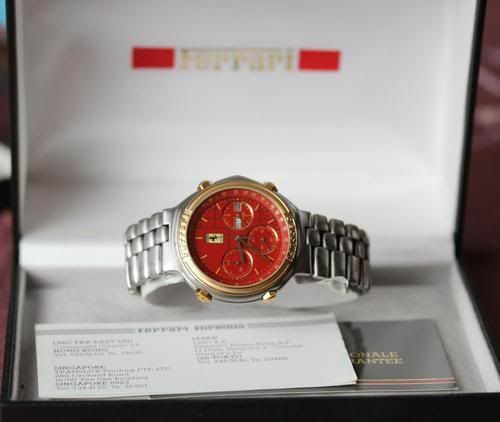 £644.59) after 18 bids. Still 2 out of 3 ain't bad, given the propensity of these things for being ended prematutely. simply because it's been hanging around, unsold, for so long (in one form or another) also finally sold on Saturday 24th March. 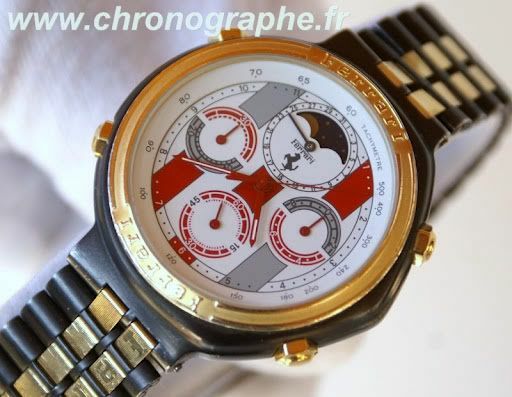 Ferrari HAU Chronopraph rot, Produziert by Cartier !! It finally sold for the current opening bid price of 990 Euros (approx. £827.67). 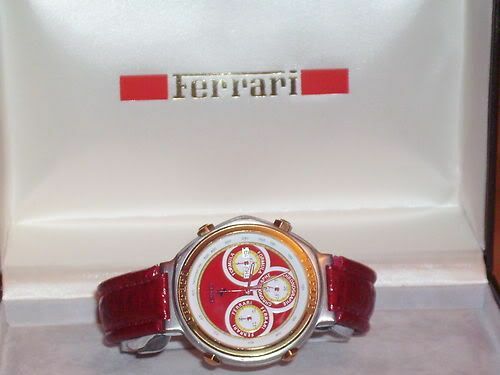 I think I can say .... that there are currently more Cartier Ferrari Formula's listed on eBay Germany than there are Seiko 7A38's ! Well now there definitely are ! So far, he's listed nine (almost) individually, in a somewhat haphazard and slapdash manner, but not quite as badly as the last time. Talk about flooding the market ! I really don't know why I even bothered mentioning it. I should have known the outcome. 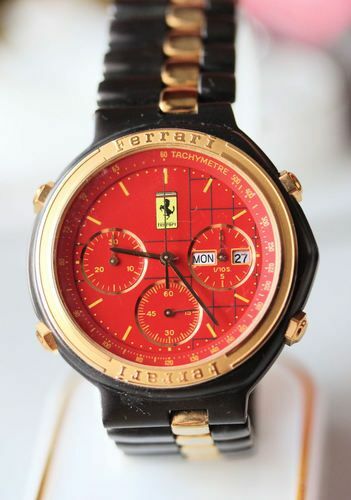 Bidding on those nine Cartier Ferrari Formula chron's (re)listed separately earlier this week, by 'Ferrari-Bburagonr1' was under way. 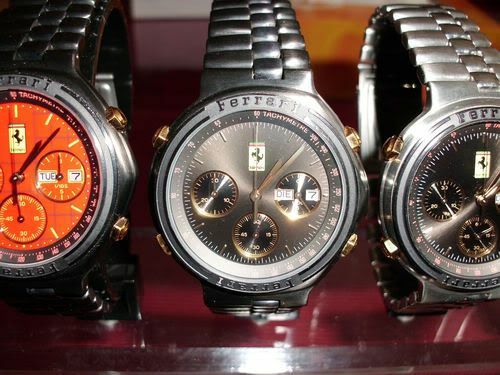 Last time I looked at them, yesterday, the prices had been bid up from the opening 1.00 Euro to between 56 and 253 Euros. I'd bid on 8 out of the 9, and had my hopes set on eventually snaring one of them (not the one I hadn't already bid on). and that he is a complete and utter tw*t of the first order ! Note the R.R.P. of the red-dialed model # F6434801, at 1900 DM, is pitched higher than one of the Valjoux-7750 powered versions ! 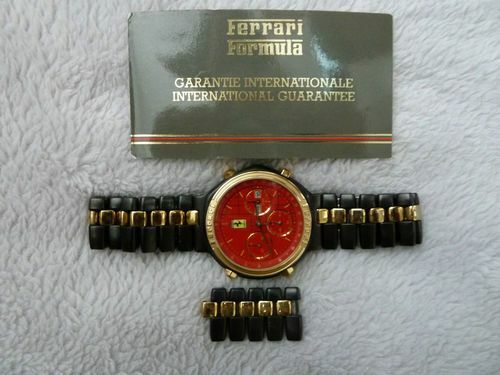 It seems even Cartier Ferrari Formula '7A48 parts watches' can go for what some might deem 'silly money' sometimes, too. It was being sold on the basis that: The item in this auction may be defective but may also work. 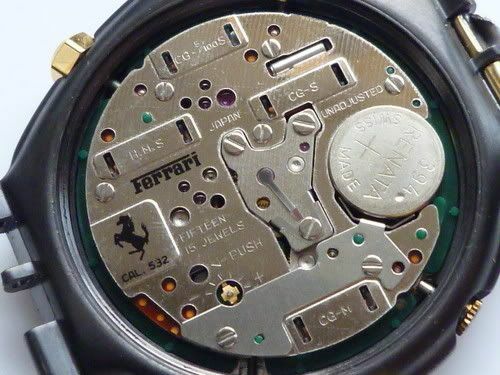 Clearly it was missing the complete bracelet (looks like it had been badly wrenched off, with some minor damage to one corner of the watch case) - and typically, also missing one pusher button cap. It might have made for an interesting rebuild project; a 7A38 / 7A48 cased Franken, or even as a case parts donor. Incredibly, even in this condition it made 202 Euros (approx. 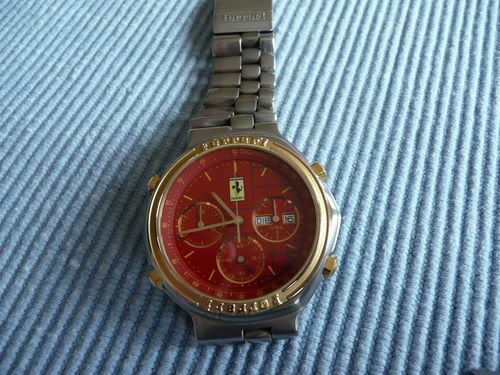 £166.69) after 18 bids. Unfortunately I didn't bid anywhere near high enough, and was well down the order in the last 5 second snipe fest. 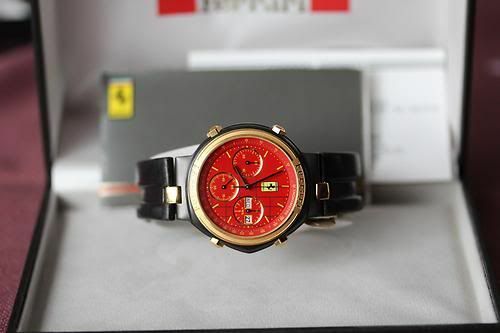 Something I did learn (or at least finally had my suspicions confirmed), is that the Ferrari version of Seiko's 7A48(A) is Cal. 532. What was it I wrote earlier ? But to a buyer with a feedback of only (1) - which always sounds a bit suspicious to me. 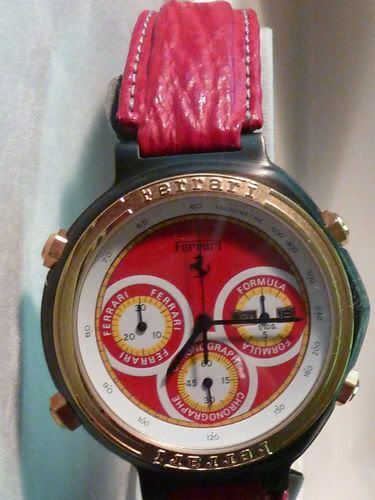 As I wrote previously, I might have a bid or two on the odd one, but I still watch a good many auctions for Cartier Ferrari Formulas. 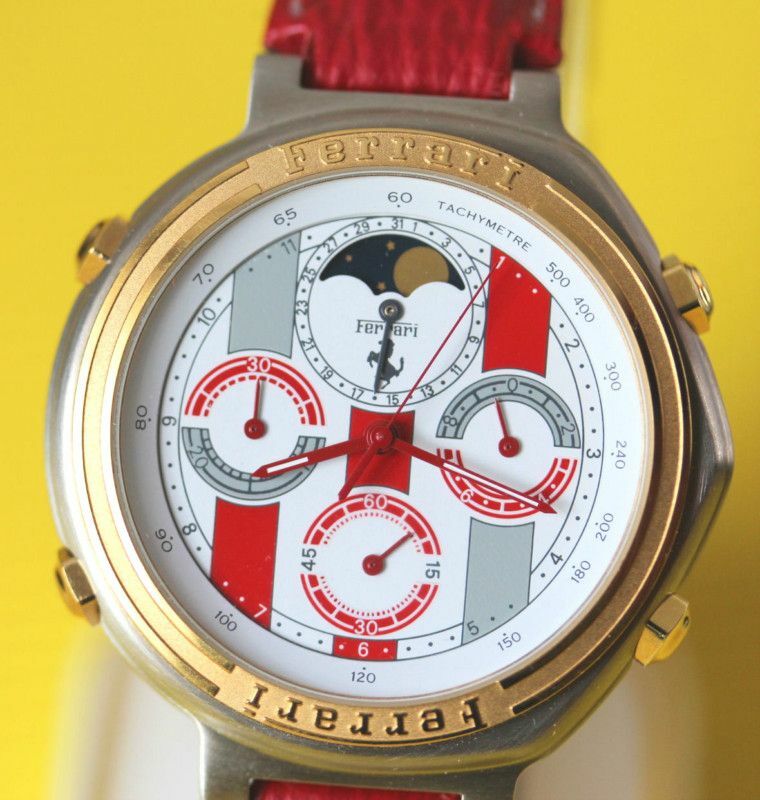 Unusually, for one of these, which I'd expect to make around 500 Euros, it sold for only 356 Euros (approx. £290.71) after 24 bids. Well it should have sold, but unluckily for the potential buyer, because that price obviously didn't meet the seller's expectations. 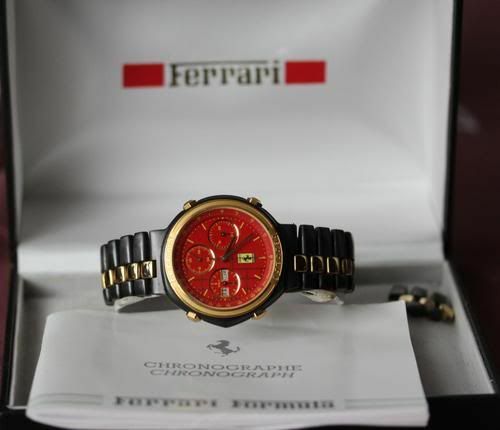 This time, with an opening bid price of 500 Euros - which he subsequently increased to 650 Euros. 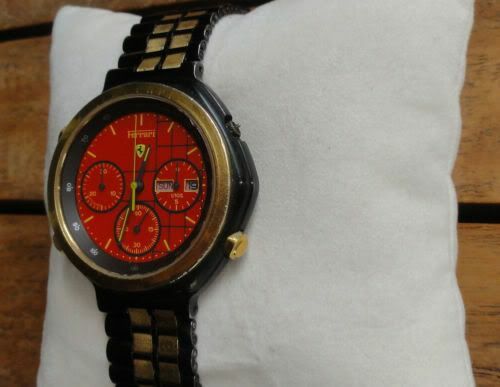 Diese Uhr habe ich am 28.5.1991 neu gekauft.Hersteller ist Cartier. Sie befindet sich in gutem,gebrauchtem Zustand. Auf dem Glas ist ein winziger Kratzer,der aber nur mit der Lupe zu erkennen ist. Sie kann gern besichtigt werden. 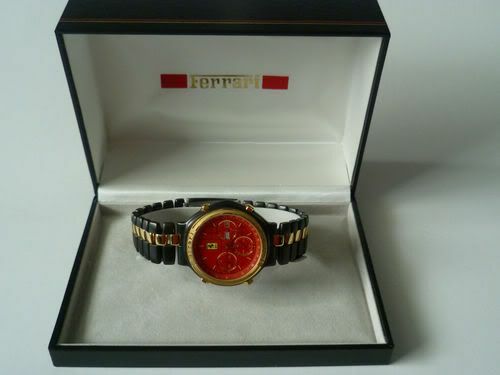 The seller confidently set an opening bid price of 700 Euros - it sold for 770 Euros (approx £628.77) after 4 bids. Which is about what I'd expect - unlike the ridiculous 2676 Euros allegedly achieved by that similar, but NOS example last month. 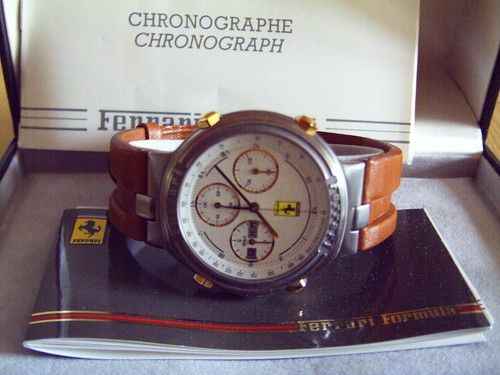 Speaking of NOS Cartier Ferrari Formula chronographs, they do still turn up on eBay occasionally - and usually in Germany. Tag- und Datumsanzeige bei "3"
By comparison, even though NOS with tags, this made 'only' 506 Euros (approx. £413.20) after 23 bids. Red or Dead, it seems. Selten getragen, fast keine Gebrauchspuren. 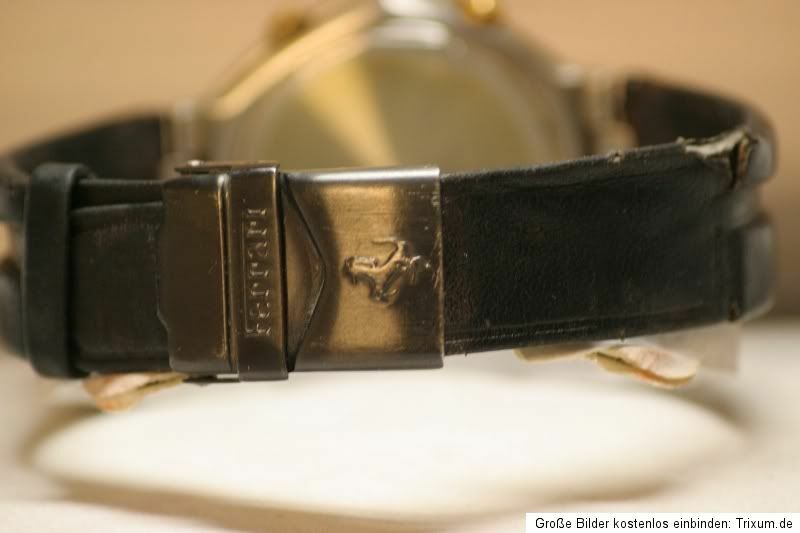 Dieses Modell wurde bei Cartier verkauft. Ein Echtheitsnachweis und die Originalbox sind vorhanden und werden mitgeliefert. the price rapidly climbed to 855 Euros within the first 24 hours, and it seems he was satisfied with that, and ended the auction early. 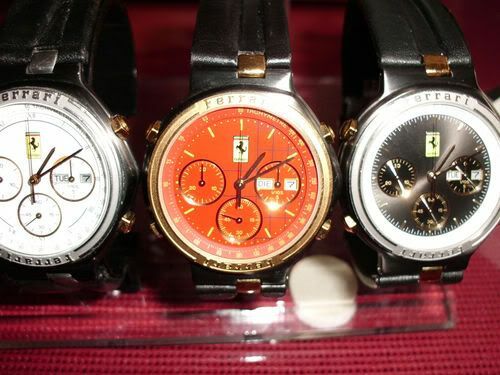 His two other eBay auctions for 'red-dialed' Cartier Ferrari Formula chrono's didn't fare so well. 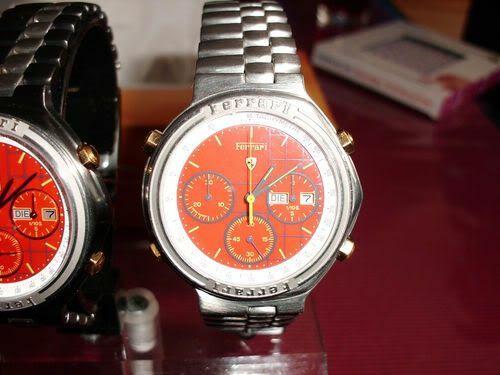 Both, as per the previously mentioned, were set up as 10 day listings, but both with an over-optimistic opening bid price of 850 Euros. Neither of them attracted a buyer. While also claimed to be in 'New with tags' condition, both - particularly the 7A48, were also rather less desirable versions on leather. 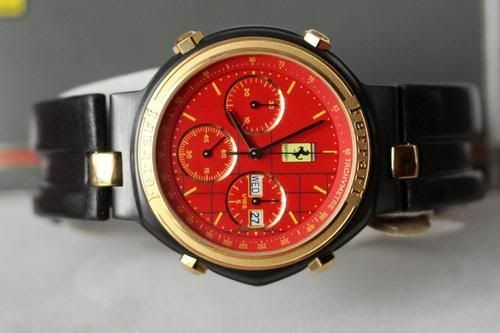 Yup - a total off 22 Cartier Ferrari chrono's listed together as one lot, with a potential value of 15,000 Euros (if they were sold singly). 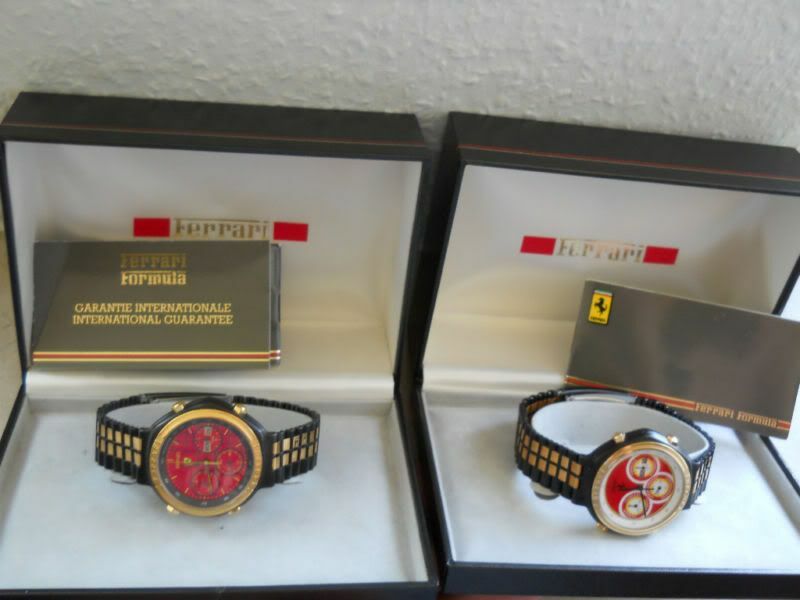 Opening bid price of 1.00 Euro, with no reserve set. 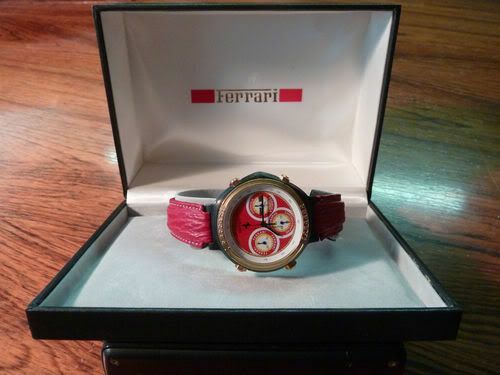 I think I can fairly confidently speculate at the outcome of this eBay auction.